It's easy to see what the fuss is about. Sanders' prose is sharper than a switchblade ... It's like Raymond Chandler, Lee Child and Elmore Leonard rolled into one.' Sydney Morning HeraldRip-offs are a dangerous game, but NYPD robbery detective Miles Keller thinks he's found a goo... read full description below. It's easy to see what the fuss is about. Sanders' prose is sharper than a switchblade ... It's like Raymond Chandler, Lee Child and Elmore Leonard rolled into one.' Sydney Morning HeraldRip-offs are a dangerous game, but NYPD robbery detective Miles Keller thinks he's found a good strategy: rip off rich New York criminals and then retire early, before word's out about his true identity. New town, new name, no worries.Retirement can't come soon enough, though. The NYPD is investigating him for the shooting of a hitman named Jack Deen, who was targeting a former police informant who also happened to be Miles's ex-lover.Miles thinks shooting hitmen counts as altruism, but in any case a murder charge would make life difficult. He's ready to go to ground, but then Nina Stone reappears in his life.Nina is a fellow heist professional and the estranged wife of an LA crime boss. Miles last saw her five years ago, when he was investigating her for bank robbery and looked the other way, for reasons he is still trying to figure out. Since then her life has grown more complicated: her husband wants her back, and he's dispatched his go-to gun thug to play repo man. Complicating matters is the fact that the gun thug in question is Bobby Deen, cousin of the dead Jack Deen - and Bobby wants vengeance.The stakes couldn't be higher, but Nina has an offer that could be lucrative. Maybe Miles can stick around a while longer and get the big payoff he's been waiting for? 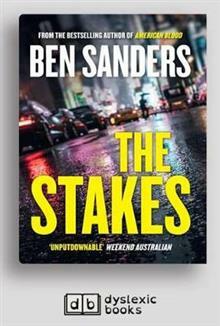 But luck has a way of running out and soon Miles is in way over his head.Effortlessly cool, suspenseful as hell and pure reading pleasure, The Stakes confirms Ben Sanders as one of our finest writers of crime fiction.